OVERLAND Park, Kan. – Bushnell, an industry-leader in high-quality sports optics and outdoor products since 1948, has introduced a new portable, easy to use personal GPS device for anglers. The simple and affordable FishTrack provides anglers of all skill levels with a palm-sized tool to help them spend less time searching for fish and more time reeling them in. Built on the award-winning BackTrack platform, FishTrack allows anglers to store up to 25 distinct waypoints and provides simple distance and direction back to marked locations while the integrated digital compass provides universal latitude and longitude coordinates. In addition, FishTrack offers a host of valuable information including time, temperature, solunar information, weather conditions and barometric pressure. Factoring in all of this information, the FishTrack constructs a predictive fish activity chart for the previous 12 hours and subsequent 12 hours to help anglers identify when and where ideal fishing conditions will occur. Featuring an innovative lightning indicator, which detects strikes within a 15-mile radius, FishTrack also provides a helpful safety warning when anglers are afield. With the ability to record up to 48 hours of trip data on the device, users can save their favorite fishing trip routes and later upload the data to the free FishTrack application. In addition to overlaying the route on a topographic map, the app also displays stats from each trip including length, average speed and temperature, while giving users the ability to save or share trips. With a weight of six ounces and a waterproof rating of IPX-4, the FishTrack is perfect for anglers looking for a small and portable GPS device. 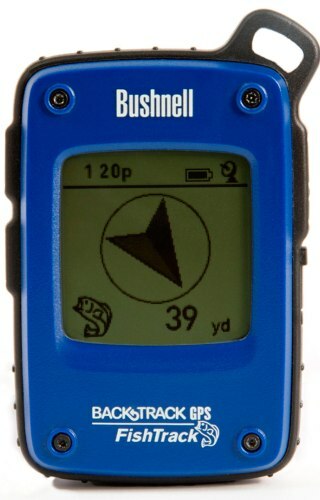 The Bushnell FishTrack GPS comes with a built-in USB interface for use with computers and other devices and has a working battery life of 16 to 20 hours. It is available for an estimated retail price of $149. To learn more about Bushnell and its complete line of sports optics and outdoor technology, visit www.Bushnell.com.